We are a friendly volleyball club based in Taunton, Somerset, U.K. We cater for all levels of players, from beginners to experts. We train Juniors to nurture volleyball within Taunton & surrounding areas. The younger Juniors start at 5 p.m. and the older at 6. Older Juniors can also turn up at our adult sessions. Adult training is every Tuesday at Wellsprings Leisure Centre, starting at 7:30 at lasts for an hour and a half. Costs: are £6 per session. Unemployed pay £4 per session. Juniors following on from their session pay £1.50. 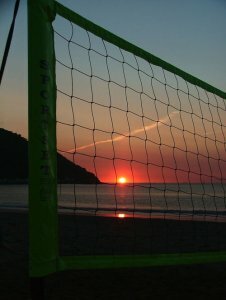 We try to participate in outdoor tournaments during the summer, which are always fun (not necessarily for the volleyball), and allow less experienced players the chance of competitive volleyball. When training/playing outdoors (also at Wellsprings), the cost will be £2 per session or £10 for the whole summer. If you are interested in playing volleyball and live in the Taunton area then please contact us. We also have a presence on Facebook. Please email me if you want access to it (and of course I know you).